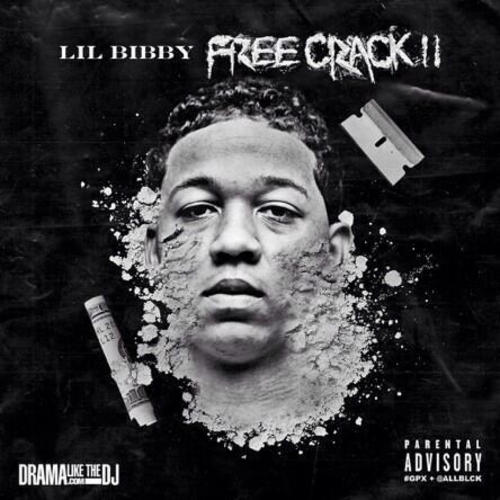 On August 29th, 2014, Chicago resident and XXL Freshman Lil Bibby dropped his highly anticipated second mixtape, Free Crack II, and proved once again that he is in this rap game for the long haul. At times there are contradictions, but that doesn’t take away from his overall impact or his lyrical ability. Bibby, a 20 year old from the east side of Chicago with the voice of a blunt smokin’ OG, provides a different type of sound than you would generally hear from the Chicago area. While it is an ever-growing subgenre, Bibby can’t be categorized simply as a drill artist. He created a style of his own, and he goes over many different types of beats created by a wide array of producers from Bangladesh to Black Metaphor. The variations in producers don’t take away from the project at all, as Bibby flows effortlessly throughout. Lil Bibby recently signed to Grade A Productions, and the increased marketing has allowed for some very high-profile features. Despite Free Crack 2 being a free mixtape, Bibby has songs featuring Wiz, Juicy J, Anthony Hamilton, Jadakiss, and Kevin Gates. He even has a track called Game Over (one of my personal favorites,) featuring another Chicago-native Lil Herb. On that track, Bibby and G Herbo characteristically display their talents by feeding off of each other’s bars. They go back and forth throughout the verse flexing and bragging about their guns and violent tendencies. A notable line from Bibby is, “Got a fo five, two glock 9s/Tryna argue? I ain’t got time/Pull up on a n***a by the stop sign/Slide the doors back, then it’s shots firin’/This Chiraq, this sh** serious.” The combination of Lil Herb and Lil Bibby is a deadly duo and I would have liked to see more songs on this project featuring the two. Side note: If you haven’t heard it already, The Best Of Lil Herb & Lil Bibby: Heir Apparents, is a fire collection of Bibby and Herbo songs before either of them had dropped individual mixtapes. You can download it HERE and I highly recommend giving it a listen. Although Bibby strays from the typical drill music that is so characteristic of the current Chicago hip hop scene, he continues to paint pictures of the violence in Chicago hoods. While some may see this as a turn off, the violence in his music is merely a reflection of the Chicago communities that he comes from. The lack of regard that politicians have for the poor community in Chicago is despicable. The corruption in government officials from the top down is undeniable. Therefore, before people criticize the new hip-hop coming out of Chicago for its antagonistic, hostile nature, they should think about what it is like to live in an area that is completely ignored by everyone outside of it. Coming from a neighborhood filled with gangs, drugs, pimps, prostitutes, resource shortages in a lacking public school system, no grocery stores, and an incomprehensible amount of abandoned houses will generally give rise to violent, sexist, and materialist lyrics; especially when these types of lyrics can be used as a tool to make it out of such a depressing atmosphere. Bibby is a disciple of the east side Chicago streets, and his message is important. The song Dead Or In Prison gives the listener a good idea of the hopelessness that Bibby felt during his younger years, and his current fame is a testament to his hard work ethic. Throughout the tape, there are quite a few samples from the movie Paid in Full. The film (if you somehow haven’t seen it,) is about a hustler named Ace from Harlem who built a thriving drug empire, and has to deal with the consequences of his illegal lifestyle. Bibby, and undoubtedly many others in the city of Chicago, were captivated and influenced by this movie and others like it. The samples are very fitting in regard to the overall theme of the project, and it helps tie things together. While the gun talk is there, you can tell that he has a lot of versatility. For example, there are several bars that clearly display Bibby’s desire for fame, such as these bars from the song Can I Get: “What you wish? I was broke or somethin/Runnin’ round the hood sellin’ dope or somethin’/N****s wish I would’ve lost hope or something.” Overall, I enjoy almost every song on the mixtape, and it can be listened to from top to bottom. Despite my dislike for the song Hispanic (which has a very basic hook and some contradictory lyrics that I spoke about in the intro,) Free Crack 2 is a solid mixtape overall. I just hope Bibby will continue to go hard on tracks and flood the streets with more lyrical free crack.